← Book review: Can Judd Ryker save Malian democracy? It’s not yet clear whether Mali will avoid its own outbreak of the deadly Ebola virus. Thus far only one case of infection has been confirmed within Mali’s borders, on 23 October. A Doctors Without Borders representative credits a rapid response by Malian and international health officials for averting an epidemic. (See also a piece in today’s New York Times: “Quick Response and Old-Fashioned Detective Work Thwart Ebola in Mali.“) The disease appears to have been contained, for now. While this news is encouraging, other problems are threatening Mali’s tenuous peace, and could prove to be every bit as dangerous as an Ebola outbreak. I want to focus on three of these problems here. 1. 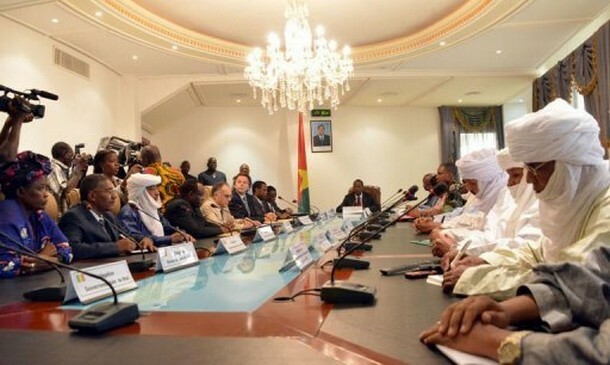 The positions of the Malian government and northern rebels remain irreconcilable. At peace talks in Algiers last month, the loose coalition of rebel groups issued a skeletal plan (see the PDF version here) calling for an autonomous northern territorial entity within a newly federalized Republic of Mali. This so-called “state of Azawad” would be subject to its own laws and administered by its own civil servants; the federal republic would have a new flag and a new capital city (relocated from Bamako to Mopti). The rebels’ proposal “would render national unity almost meaningless,” according to unnamed sources in Bamako cited by Africa Confidential. The Malian government’s own proposal calls for an enhanced decentralization regime (see the PDF version here), shifting a degree of authority and resources from the national government to a new set of elected regional governments — but rejects any federal solution. The Algerian government, which is mediating the peace talks that began in September, is pushing hard for a deal to be reached by the end of the year. Even if a compromise is agreed to in Algiers, however, it will be rejected by many rank-and-file rebels and government supporters alike. Recent skirmishes between Tuareg rebels and Malian troops south of the Niger Bend signal rising tensions on the ground. This is not even to speak of groups absent from the Algiers talks, which brings us to the next problem. 2. Armed jihadists have not been beaten. For several months after French and Chadian troops chased Islamist fighters out of northern Malian cities in early 2013, the threat posed by Al Qaeda in the Islamic Maghreb (AQIM), MUJAO and other jihadist groups appeared to have subsided. This year, however, has seen a resurgence of violence in the north of the country, despite the French military’s renewed efforts to hunt down jihadist fighters. A French sergeant was killed in late October during one such operation in the Kidal region. Lately the jihadists have been targeting their attacks on peacekeepers and bases of the UN’s Multidimensional Integrated Stabilization Mission in Mali, or MINUSMA, in the north. Since June, by my count from UN press releases, 80 MINUSMA troops (from Burkina Faso, Chad, Niger and Senegal) have been killed or wounded in a dozen separate incidents involving IED explosions, ambushes, and mortar barrages of UN patrols and bases. Sporadic IED attacks in the region have also targeted Malian army troops as recently as this month. The jihadists want to convince northern Malians that neither the UN nor their government can protect them, that in fact the very presence of the Malian government and the international community in the north endangers them. Which brings us to the third problem. 3. MINUSMA is in serious trouble. Northern Mali is the size of Texas, and securing the area requires considerable resources. But the UN’s operation there suffers from too few personnel, not enough equipment, and poor leadership. The size of MINUSMA’s security contingent, which is supposed to exceed 12,000 men, currently stands at 9,000 — and diplomats close to the mission don’t expect it to get any higher. MINUSMA also lacks the airlift capacity, especially helicopters, to carry out its mandate. Consequently, its power in the north is tenuous. One researcher recently told me that MINUSMA exerts “nominal control” over the cities of Timbuktu and Gao–but even there, only during the daytime. The rest of the north is effectively outside the orbit of both the UN and the Malian government. Part of the problem is that MINUSMA has been rudderless for some time. Bert Koenders, the UN Secretary-General’s Special Representative and head of the mission, left in October to take up a new post (as foreign minister of his native country, the Netherlands). No successor has yet been named. Relations between the mission and the Malian government are poor. Staff morale is low. Even within the wider UN bureaucracy, MINUSMA is perceived as a dysfunctional mission. As problematic as MINUSMA has been, however, it doesn’t seem likely that Mali can live without it in the near term. If the international community is to achieve its objectives in Mali — stabilizing the north and protecting its civilian population — MINUSMA will require a serious reboot. With the Malian military still unable to carry out its mission, the country will remain under international security supervision for the foreseeable future. (UN peacekeeping operations in Africa are rarely short-lived: blue helmets have been in Cote d’Ivoire and Liberia for over a decade, and in Congo-Kinshasa for 15 years.) Northern Mali is already becoming a theater for protracted low-intensity conflict between jihadist fighters and the international community. The jihadists are playing a long game there, cultivating support and even marrying into local populations. Victory, from their perspective, does not require defeating French or UN forces in battle; it merely requires outlasting them on the ground. They know that one day, probably several years from now, those forces will pack up and leave. What seems most likely to take their place? The Tuareg nationalist cause, for its part, has only been emboldened by Bamako’s weakness, and its leaders are pressing their advantage at the Algiers talks. But an independent “Azawad” would be neither sustainable nor practical, and given the post-independence disaster that is South Sudan, the international community has no stomach for another two-state solution in sub-Saharan Africa (whatever Mali’s conspiracy theorists may think). The Malian government, for its part, has done nothing to win the support of neglected Songhay populations in the north, let alone disaffected Tuareg. President Ibrahim Boubacar Keita, beset by corruption scandals, hasn’t shown that he can even govern the south effectively. Government spending is essentially under the control of the International Monetary Fund. Surveying this scene, it’s hard to avoid concluding that Mali has already become, in the eyes of the international community, one of those African “basket cases” like Somalia or the DRC — the sort of country that survives only under international receivership, where violence and unrest have become the norm, and where state power is almost gone over much of its territory. While we don’t know what the future will hold, a return to the status quo ante, with a nominally sovereign central government in Bamako managing more or less to preserve stability, seems almost out of the question. Maybe Mali’s problems are simply the latest sign that the nation-state system in Africa has outlived its usefulness. If that is indeed the case, we can only hope that something more enlightened and durable takes its place. Postscript, 12 November: The Malian government has reported two more deaths from Ebola, apparently unconnected to the first case confirmed last month; reports suggest that a number of UN personnel are under quarantine in Bamako’s Clinique Pasteur, where one of the fatalities was treated, and where the other fatality worked as a nurse. Reuters reports that the clinic was under police lockdown as of Tuesday evening. And the Times has run a new story entitled “Outbreak in Mali Eclipses Early Success.” Thus the only apparent good news out of Mali lately turns to bad news. This entry was posted in Uncategorized and tagged MINUSMA, politics. Bookmark the permalink. It seems to me that for all practical purposes, Mali is already split into two countries. Here in the south, things seem to work as well or better than in many other third world countries. I think many people who live here in Bamako would be very surprised at the “basket case” characterization. With ebola and the war, one can certainly see the international community taking over governance bit by bit. I’m not sure that is a bad thing. What do you think about the differences between Niager and Mali? Niger is just as vast and ungovernable as Mali, with a similar ethnic mix, but things are much quieter over there. Bamako is much more of a modern city than Niamey, but in Niamey they are doing something right. Actually, I don’t see why we should be pessimist; only if we built our (a-historical) world view on a concept of permanent borders and were shaken by any aberration.. We are seeing natural processes in MENA that will lead to corrections of old maps drawn by the colonial powers, a century or half-century ago. I suppose it depends on what one means by “the north”–Kidal being the perennial seat of separatist movements. Much of the Malian news media appears to assume that the vast majority of Kidalois are just waiting for the chance to throw off the yoke of MNLA oppression and welcome back the central government with open arms. One example of the Bamakois wishful thinking you mention is a recent article in La Sentinelle claiming that Kidalois are hoping for the return of the Malian state. Surely some of them do, but how numerous are they? 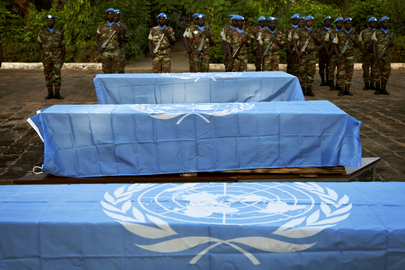 According to the latest update in Your blogg (28 November) there has been 31 UN-troop casualties, but on the UN website for MINUSMA (http://www.un.org/en/peacekeeping/missions/minusma/facts.shtml) the figures says 20 troop casualities. What is your opinion about this discrepancy? I’m not sure about the distinction between the Financial Times‘ figure and the UN’s figure, but I suspect that page on the MINUSMA website is not up to date.